Here were some of the latest developments on ulogs.org. This is to address ticket #52 in github. 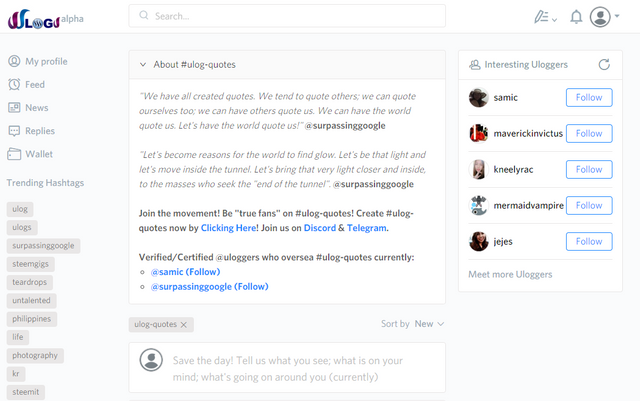 It's a simple addition of text on the #ulog-quotes feed to inspire readers to share their favorite or self-created quotes. There were two files edited for this feature. One was for Feed.less which basically added a style class that will add a 20 pixel margin at the bottom of the caption, and Page.js which is where the main logic to display the caption is coded. There were actually two PRs related to this feature because there was a misunderstanding regarding its specification. I thought that the caption was supposed to be displayed only when the user visited ulogs.org/created/ulog-quotes. However, as per chat with Terry, he also wanted the caption on other filters - trending, new, active, and hot. As such, the second part of the implementation was PR #60 which basically changed the checking from location.pathname to just the category. This is the same with issue #2096 in busy.org. This change will only display the editor when the user exactly visits the /editor location. The file changed was src/common/routes.js to only render the Editor component when the user exactly visits the /editor location. Thanks for the contribution, @eastmael! A small feature, but cool nonetheless. There isn't really much to review here, but if I could point out one thing that would be great for future contributions: maybe you could link to an introduction post of what ULOG actually is. Over than that, it was a very nice to read contribution, especially the "Lessons Learned" section was a nice reminder - keep up the good work! Thanks Amos. I'll keep your suggestion in mind to include an intro about ulogs. These Features are so cool thanks for sharing,have a great day. Thank you @sarah.taylor. There will be more to come.